Was kinda a so-so episode. It is nice to see Steven acting a bit petty though, like a regular kid. The show doesn't have many people who are really unapologetic jerks, especially to the degree that Steven can drag out the four-letter word about them. Greg was actually kinda shocked. The thing that struck me as hollow was how Kevin came around at the end and was upset at Stevonnie's not caring about the race at the end. Sadly, I find, most jerks have an immunity to the kinds of anger they inflict on others. Oh, and I did like how effortlessly Kevin could push Stevonnie's buttons. That's pretty accurate at least, for the jerks I've seen. One thing I've not seen much of in descriptions was Stevonnie hallucinating the road crumbling behind them, and Kevin's face looming up like a monster. Something like that happened back in Alone Together too. It seems that they are vulnerable to anxiety hallucinations, which is an interesting touch, gem fusions don't seem to suffer from that. Also, Ronaldo was surprisingly cool this episode. that hallucination scene also reminded me of that moment in "Gem Drill" where Steven starts psychially/empathically connecting with the cluster. I thought maybe they were starting to connect with Kevin's mind, and it wasn't pretty. Always fun to see what anime series have influenced the creative team, but I'm surprised at how blatant a reference to Initial D this episode turned out when everything else has been pretty subtle. I think I missed something. How did Stevonnie learn to drive like that? Haha, that preoccupied me too. How did they not only know how to drive, but how to drive stick? My husband was theorizing that being a fusion grants a certain amount of generalized hypercompetence, which is why Garnet is a really! good! swimmer!, even though all we've ever seen Ruby do is walk underwater, and all we've ever seen Sapphire do is freeze it. Steven and Connie might not know how to drive, but they've both watched a lot of driving and that was enough for a being in Stevonnie's heightened state. I dunno, though, I'm not totally satisfied with that. Much though I enjoyed the episode, I'd have appreciated a throwaway line explaining how the hell that worked. Some people on another forum thought there was a similarity between Stevonnie's anxiety hallucinations, the dreamworld where Steven would meet Lapis and Jasper as separate people while they were (badly) fused into Malachite, and some things about how Garnet acted while she was having trouble staying fused in Keep it Together. They speculate that that's what it's like in a fusion when you're falling apart. And yeah, I figured Stevonnie's driving skillz came from a combination of video games, some practice (Steven could drive stick in Lars and the Cool Kids) and the various natural bonuses that seem to come from fusion. I was wondering if maybe Steven has some latent memory of driving from Rose. Could Rose drive? Pearl can drive. 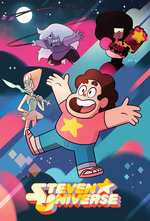 There is one official image, from the "Steven's Guide to the Crystal Gems" book, of Rose and the Gems in a small, pink car. I spent a summer with my partner mainlining Initial D, so this was a wonderful bit of nostalgia. Jenny refers to Stevonnie as "they." I guess because they're a fusion, it's a little ambiguous whether that's a singular they, but I don't recall this being used for other fusions. FWIW, we have confirmation from an SU writer that Stevonnie's pronoun is "they."